It’s bitter cold and windy. My arugula finally gave up, and Wegman’s tomatoes are starting to look attractive (but not enough so to actually buy). It must be time to order seeds! ‘Beedy’s Camden Kale’ is the tastiest tenderest kale that I’ve tried. There may be a better one out there, but I’m not a gambler when it comes to kale. Only Fedco carries it. 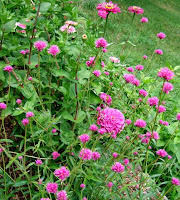 Fortunately, Fedco has other merits: free shipping for orders over $30, lots of heirloom flower seeds, and good prices. I'll get my order to $30 ... somehow. 'Loma' lettuce from Territorial, a Batavia, has been an absolute favorite for several years. It's crisp, long lasting, and a good seed producer. In fact I don't even need to buy seed because I always let a plant or two go to seed every year. But I do plan on trying a new lettuce, 'Two Star', also in Territorial's catalog. They have a chard, 'Perpetual', that looks promising, and I will certainly order my preferred Genovese-type basil, 'Aroma 1', which doesn't flower as readily as others, and 'Fortex' pole bean, really tender and a champion producer. Also, crimson clover, my favorite little nitrogen-fixer, and 'Mr. Majestic' marigold. So Territorial comes through! Burpee is by far the most expensive seed catalog, but unfortunately it's the only one to offer 'Fireworks' gomphrena, which I must have. And as long as I'm ordering from Burpee, the Pot Luck dahlias are tempting. They also have 'Northern Lights' pentas, which I highly recommend, but only if you have access to a greenhouse. I will not order tomato seeds, as I only have space for about three plants. I plan to buy starts from Eagle Point or Meadow View farm, because I know they raise them from seed. Last summer a southern mega-producer managed to inoculate the entire northeast with Late Blight by shipping infected seedlings to big-box stores. So live and learn, and buy your seedlings only from a trusted source! As for tomato varieties, my sources tell me that 'Plum Regal' and 'Mountain Magic' are extremely blight resistant. Unfortunately I don't see them on the market. I will try to find 'Husky Cherry', the best container tomato I know, and 'Ramapo', a productive and very tasty mid-sized tomato. It can make sense for gardeners to order seeds cooperatively, in larger quantities, and share. I have a thing for old tools. 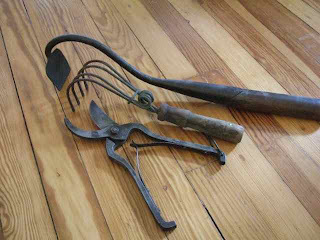 Tin secateurs, curved sickles, and bent-wire cultivators are among my favorite finds. My very first acquisition was a pair of elegant secateurs, which I discovered in an antique store in Milford, New Jersey. The owner obviously did not appreciate their magnificence … “You can have it for a buck,” he said, somewhat dismissively. I paid quickly before he could notice the obvious beauty of the sleek lines, and the ingenious curved tin spring that held the blades open. At home, I scrubbed the handles with steel wool, oiled and sharpened the blades, and then found a spot on my kitchen wall. And so I was hooked. I began checking local antique shops, looking for dusty bins and boxes in back rooms that held unappreciated treasures: spades with carved wood handles, two-handed scythes, dandelion pullers with bent shafts. In Ely, England I found a graceful swan-necked hand hoe of fearsome heft and useful length and snuggled it inside sweaters in my suitcase, hoping that it did not arouse Custom officers’ suspicions. A curved sickle was my next find. I’ve never actually used a sickle, though it was the one tool the Communist party chose to represent agriculture and linked with the hammer, icon of industry, on a field of blood to create the Soviet flag. This makes me think that I should sharpen it, and discover its usefulness. Someday I will have enough worthy tool treasures (to be worthy they must be graceful in design and efficient in use) to create a wall of garden tools, all shined up and sharpened. They remind me of human ingenuity, of the importance of craft, of the traditions of farming … at least that’s how I justify my old-tool mania. The simple truth is, I just like to look at them. Ah, summer … the smell of newly mown grass, the gas-powered hmmmm. If your neighbors use chemicals on their lawns you are more likely to do the same. People who are more educated are more likely to involve themselves in risky lawn behavior. People who take pride in their lawns are more apt to know their neighbors’ names. Allowing a (gasp!) dandelion to bloom on your lawn is not just lax, it’s downright irritating to your fellow citizens. At least that’s what your neighbors are thinking, according to Robbins. He offers a few suggestions for reform-minded addicts. For one, your lawn does not have to be the boss of you. Realize that there’s a whole industry out there with a vested interest in making you think your turf has problems, making you feel like you’re a bad citizen if you let a little clover grow—which by the way was a desired part of all lawn mixes before 2,4-D came along. Then it all of a sudden became a nuisance, a most convenient development because 2,4-D does not discriminate between good and bad but kills all non-grass plants. Encourage diversity, says Robbins, and especially clover. It fixes nitrogen, so you won’t need to fertilize as much, or at all. And tolerate dynamism. Now who doesn’t love dynamism? Beware of “organic” (quotes are Robbins') alternatives; they may make you feel better but too much organic fertilizer is no better than too much chemical fertilizer. Following the herd may be the path of least resistance, but think of it this way: not counterproductively killing plants like clover, not fertilizing, not collecting your clippings, not edging may be the easiest path to individuality you’ve got. You'll sleep better, and you'll have more time to plant gardens in your newly dynamic yard. If you want to know more real facts about the lawn industry, the American lawn obsession, and the lawn ecology, read Lawn People. Ok, now I’m going to go find out my neighbors’ names.